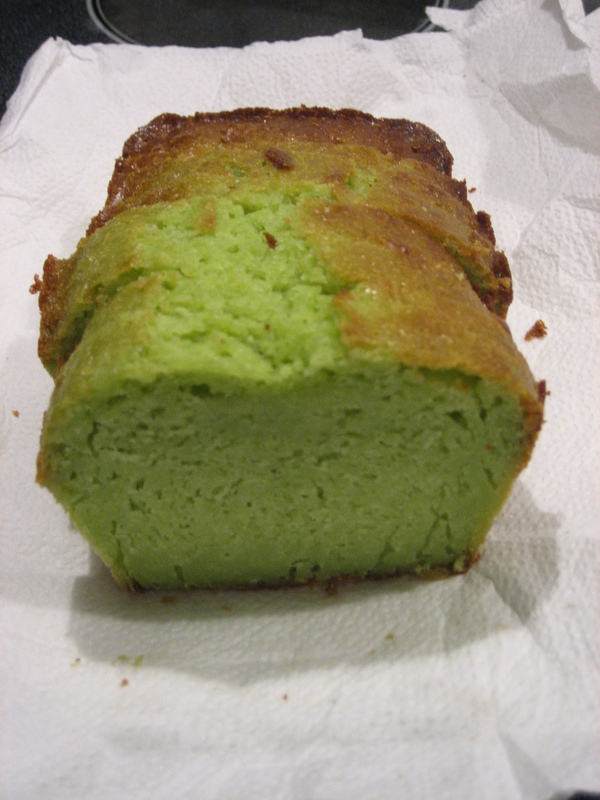 October ’10: Green Tea Bread, Coconut shortbread, Lemon Coconut Bread, Pumpkin Bread, Cornbread | . :.ღஜღ 安德莉亞の煮意空間 ღஜღ.:. Green tea powder ain’t cheap…. the one I used is a Japanese brand. 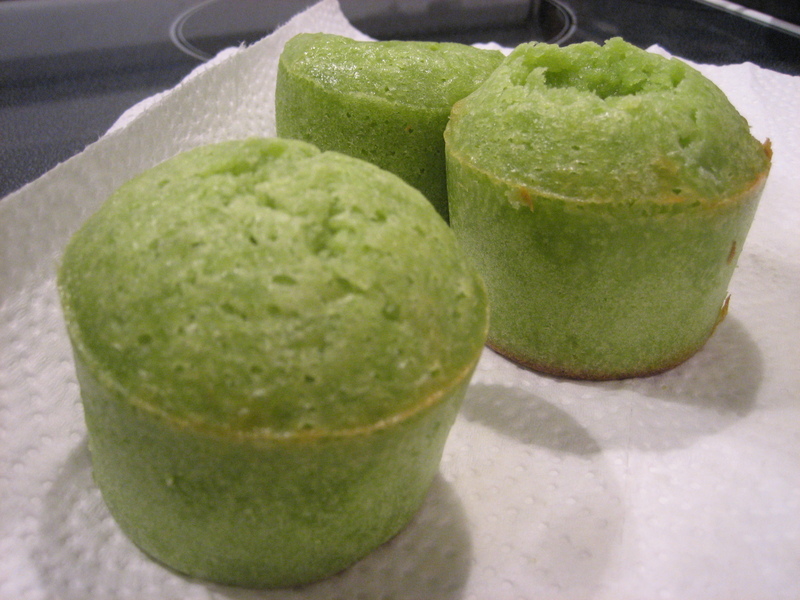 The green tea powder from Taiwan lacks a nice green tea aroma, and the green tea powder from China is bitter :X.
I made two different recipes. The first recipe was a failure because I forgot to add one whole cup of flour, so it wasn’t the recipe’s fault. It’s called a condensed milk cake. I was afraid it might be overly sweet, and turns out it’s just right amount of sweetness. I really liked this recipe so I think I’ll make it again. I think I tried the second recipe before with a lemon bread, I decided to go with the second one because it only required one egg. Butter and flour a 9″ x 5″ loaf pan. In a small bowl, combine flour and baking powder, set aside. In the bowl of a stand mixer, cream butter, sugar and salt until light and fluffy, about 2 minutes. Add condensed milk and mix until just combined. Add the dry ingredients, mixing just until all of the flour disappears into the mixture. Spoon batter into prepared pan, smoothing the top with a spatula. Bake for 70 – 80 minutes, or until a thin knife inserted into the center comes out clean. If the top of your pound cake looks like it’s browning too quickly, place a foil tent over it for the remainder of its time in the oven. Preheat oven to 350 F, grease and flour an 8×4 inch loaf pan. In a large bowl, mix flour, baking powder, sugar and salt. Cut in butter. Break 1 egg into a measuring cup and then fill to the 1 cup line with milk. Add to dry ingredients and beat well. Add vanilla. Pour batter into an 8×4 inch loaf pan. Bake at 350 F for 30 minutes or until a toothpick inserted into the center of cake comes out clean. Was going to make cookies, the dough was too hard to roll and so I just made into bar cookies. I will add more coconut if I was going to make it again. Just bake at 325F until done…. 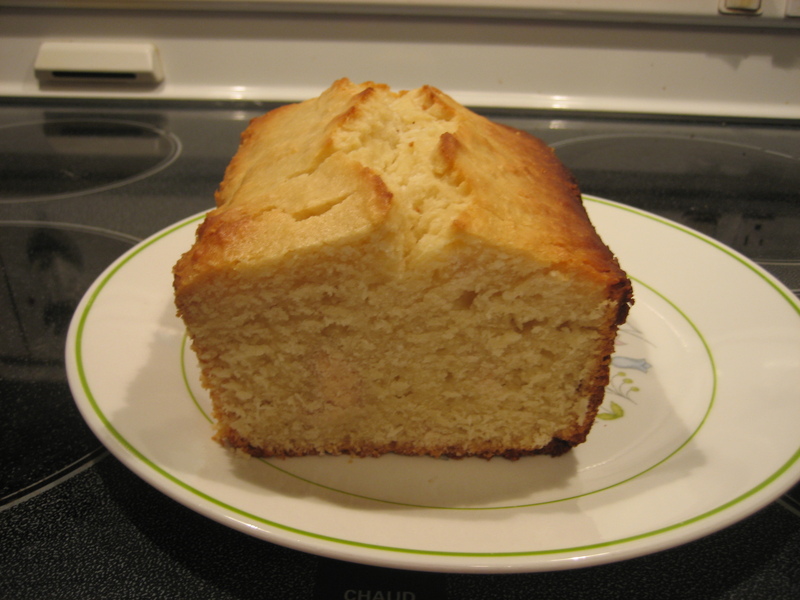 I used a 3 x 7 bake pan, and now I just remember I have a 8 x 8 square pan…. Good blend of lemon and coconut. Heat the oven to 350°. Grease and flour an 8×4 inch or 9×5 inch loaf pan. In a large bowl, mix together the flour, baking powder and salt using a rubber spatula, then stir in the sugar and coconut. In a small bowl or large measuring cup, whisk together the eggs, milk, lemon juice, lemon zest, and vanilla. Make a well in the center of the dry ingredients and pour in the egg mixture, stirring just until combined. Add the melted butter and stir just until smooth. Be careful not to overmix. Pour the batter into the prepared pan and bake for 65 to 70 minutes, or until a toothpick inserted near the center of the loaf comes out clean. Ovens vary, so start checking for doneness after about 60 minutes (55 if you’re using a 9×5 inch pan). Let the bread cool on a wire rack for 10 to 15 minutes and then carefully remove it from the pan. Try not to slice into the loaf until it’s completely cool, but that probably won’t be possible. Store in an airtight container for 3 days or wrap in plastic and/or aluminum foil, pop in a plastic zipper bag, and freeze. Preheat your oven to 350 degrees. Grease and lightly flour two 9x5x3″ loaf pans (we used ceramic loaf pans). Sift together the flour, baking powder, baking soda, salt, cinnamon, and nutmeg into a large bowl and set aside. Whisk together the sugar, eggs, and oil in a separate bowl until well blended. Add the canned pumpkin. Back to the recipe – stir into the egg/sugar/oil mixture the pumpkin puree, water, and vanilla. Mix well. Now gradually fold the dry ingredients into the wet, stirring just enough to moisten and blend all the ingredients. Do not overmix. Let the loaves sit for about 15 minutes in the pan. During this time, as the loaf cools, the edges will start to pull away from the sides of the pan. When you see this gap all the way around the loaf will turn out of the pan pretty easily – a couple shakes may be necessary. 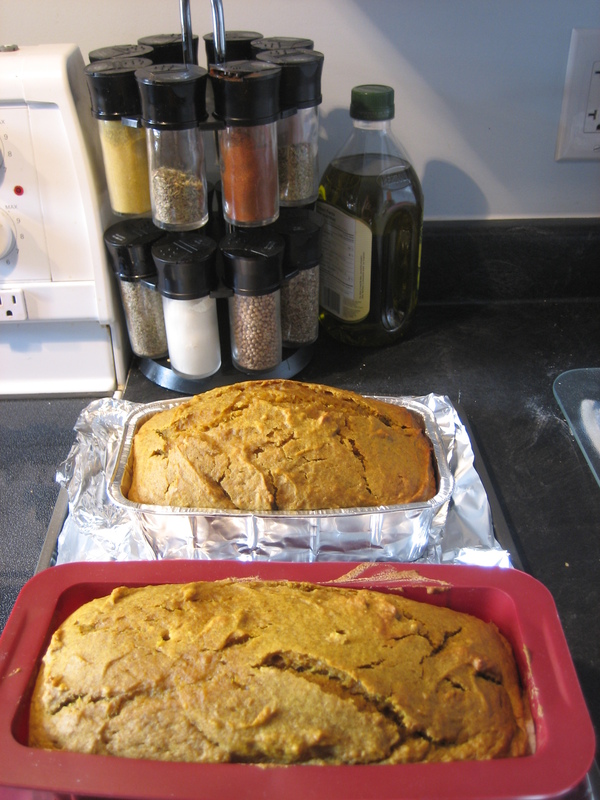 Let the loaves cool out of the pan for at least an hour before slicing, if you can wait that long. This is from a mix I picked up when I moved out from residence in April. 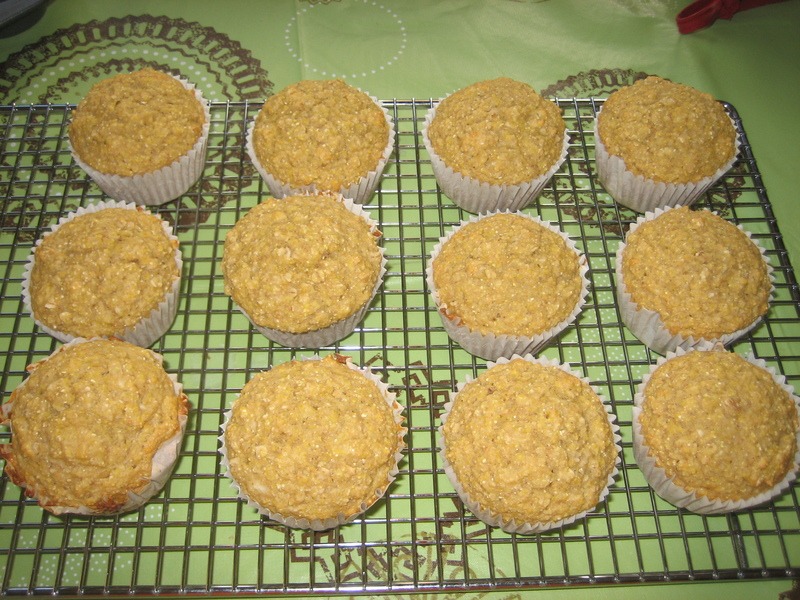 I substituted some of the cornmeal mix with oatmeal. I never knew you baked so much! 🙂 I love baking and cooking as well.. but not much time nowadays. Too busy to even sleep!